High school musicians may spend the summer practicing their instrument or making music with friends. 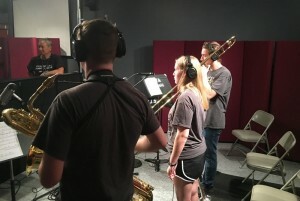 More than a dozen of them just spent a week exploring another part of the music world at an unusual summer camp – an Audio Production Camp in Arlington. On one side of the glass, UT Arlington’s jazz camp septet is playing their Afro Blue chart in the recording studio on the University of Texas at Arlington campus. On the other side of the glass are 14 north Texas high school kids and one from out of state listening to the digital mono mix through a pair of professional Adam Audio S3A speakers. Micah Hayes, who runs the music industry program at UT Arlington, is head counselor for the week’s audio production camp. He wants these campers to know what audio production is really like, showing them the different kinds of microphones, speakers and such. 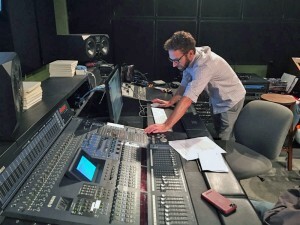 Micah Hayes heads UTA’s Music Industry Studies program and runs the week-long summer audio production camp for budding high school producers. Hayes didn’t experience any of these studio techniques until college, in California (at Chico State). After graduating, he became a recording engineer with the New World Symphony, got a composition degree, then engineered events like the Aspen Music Festival. He says he would have loved this production camp in high school. Camper Brennan Youngblood likes the head start. The Garland High School bass and sax player has made recordings with his school and church bands. Seventeen-year-old Kamaria Cozart, from Wichita East High School, in Wichita, Kansas, also plays several instruments. She almost signed up for the jazz camp here, but really wants to produce her own music, so chose Audio Production. As a trumpet solo is heard, Hayes says there’s usually a right and wrong mic for each instrument. Various microphone types and their uses –that was new information to Crowley High senior Zhana Woodard. “Like, I’m definitely going to take that piece of information home with me so I know more when I go back to my home studio, so I can get a better quality,” Zhana says. Granted, her home studio is pretty much just a corner of her bedroom. Her younger Crowley classmate, 16-year-old junior Sheldon Blair Jackson, III, signed up for this class wanting to focus on live ensemble recordings. “When you produce with live instruments you get that special raw sound, so I’m kind of leaning toward that,” Sheldon says. Teaching live recording and post-production techniques is Michael Johnson, one of Hayes’ undergraduate students. After exposure to these production and final-mix tips all week, Micah Hayes says campers get an honest, inside look at what this world is really like. That’s why Hayes figures if any of these campers are as excited at the end of the week as they were at the beginning, he may see them back here in a few years.